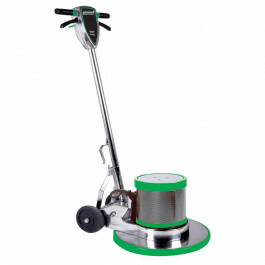 This 20 inch dual speed floor buffing scrubber by Bissell is a great addition to any janitorial equipment line. The dual speeds allow you to switch from scrubbing, to buffing, with just the flip of a switch. Take your machine to a jobsite and let it do all the cleaning for you. 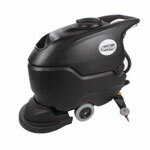 You can scrub your heavily soiled carpets, and buff your customer's tiled floors with the same machine. No longer do you have carry a high speed burnisher, and a low speed scrubber to clean your retail stores. This machine handles it all! The all metal chassis adds weight to the frame to allow for a more thorough cleaning. The fully adjustable handle has safety enhanced interlock switch, which ensures both hands are in control of the machine at all times. Comes with a 5 year warranty on motor and transmission! Make sure you're buying the most effective equipment at the best price, at all times! It's an easy to use machine with the pad holders. Does a nice job at a reasonable price.